This course is designed to run over 5 days and covers a variety of craft skill incorporating PET plastic as it preferred medium of choice. Upcycle has an extraordinary passion for the planet and hopes to keep it as green as possible. Our speciality is creating beautiful items from general waste. We take some of the most commonly tossed waste items and turn them into practical yet lovely art pieces. It became apparent that we could share our knowledge and therefore we have created training courses. A simple 2l Cool drink bottle can be transformed and our training teaches you not only, into what, but how. 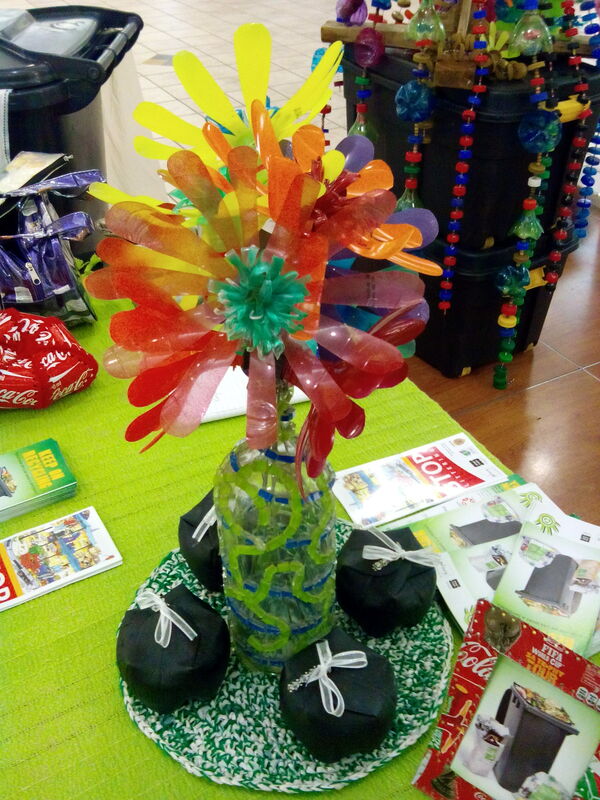 The first example of transforming a used 2l bottle is to create a beautiful mobile. It’s a simple process of cutting the bottle into design templates, painting these and finally assembling all the pieces. Mobiles can be used to decorate windows, doors, gardens and brighten up even the dullest areas around your home. This particular skill incorporates working with ceramic paints, basic cutting skills and some bead work. Most people find it tremendously difficult to grow plants or flowers from seedlings. Our next idea makes that process easy and effective. In this part of our training, we will teach you how to create a mini garden for a flower or herb and instruct you on all the necessary requirements to ensure your seedling grows into a fully grown plant. It’s essential these days to plan our own gardens and supplement our food sources, by learning this particular skill, not only can you achieve that goal, but you ensure our planet is kept green. If you plant in the middle of the year and nurture your seedling well, you can easily transfer your plant, into a sustainable garden, by the end of the year but more importantly you can remove the top section and surprise a family member or friend with an incredible, home-grown Christmas gift. In this module, we teach you how to look after a vegetable patch as well as developing a sustainable garden using a simple upcycled tool. We like to be practical but certainly we love being creative even more and that’s why we transformed old 2l cool drink bottles into brightly coloured flowers. Flowers always brighten up any room and during this segment, we will teach about cutting specific design from the bottles in order to create the perfect bouquet. The possibilities are endless and so are the creative ideas when making these particular flowers. Painting and decorating skills are also covered in this segment. Old 2l cool drink bottles make amazing bowls. These bowls can be used to store you bits and bobs on your desk, they can be used to tidy up all your nuts and bolts in your garage, the can be used as sweet bowls or simple flowers pots on your dining table at your next event. The uses for bowls are endless. Who doesn’t love hearing birds sing? Let us teach you how you can make them sing by feeding them from an old used 2l cool drink bottle. In some instances, you can combine the use of a 2l bottle and incorporate the smaller 500ml bottle to create a bigger feeder. 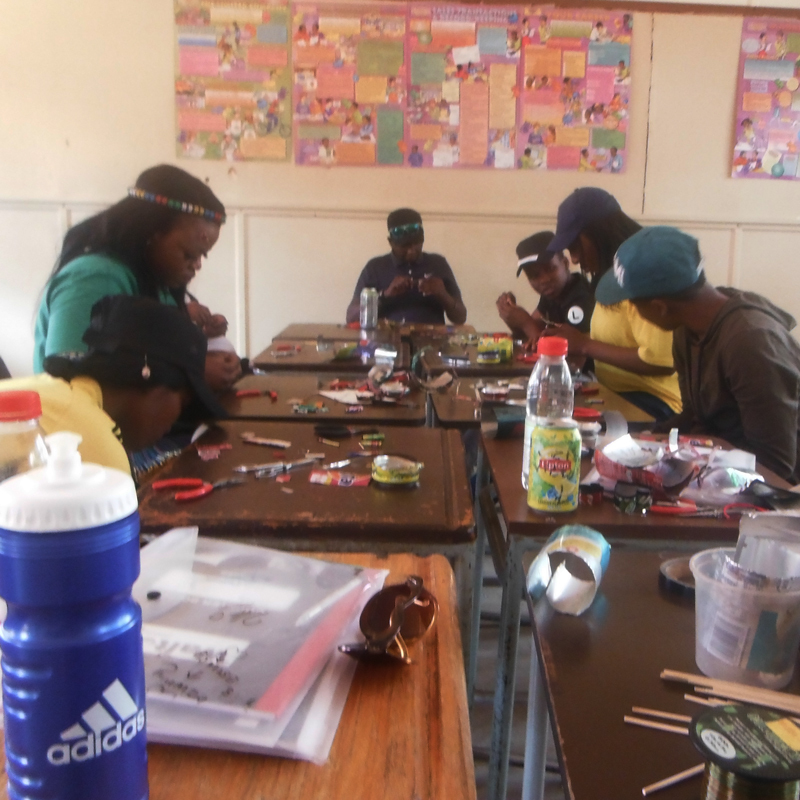 Again, the use of different practical skills such as cutting and painting are incorporated here. In this segment of our training programme we turn to tin and in particular a used cool drink tin. Once we started researching some of the items we could create using a simple old discarded cool drink tin, we were flabbergasted at how many incredible ideas where our there. Decorate your table for that special occasion using an upcycled Tea Light Holder. This is such a fun project, the designs are endless and the effect wonderful. Let us show you how to take you used tin cans and create the perfect mood setting at your next dinner party. Using a similar process, that being pattern design and cutting, we can also create wonderful serviette holders using old cold drink cans. Here we will show you how to create the perfect rose shaped serviette holder. Using a template, the tin cans are cut into pieces which then get assembled, with the use of wire, to create the rose. Obviously once you have mastered the art of the rose, the design ideas for other types of serviette holders are limited to the length and breadth of your imagination. Who doesn’t love beading? Well instead of buying beads, we would teach you how to make your own. This simple and easy process to follow will allow you to create your own beads, using old tin cans. Once again, when it comes to making jewellery from old cold drink cans, there are endless possibilities. In this section of the training, we hope to fire up your creative juices. 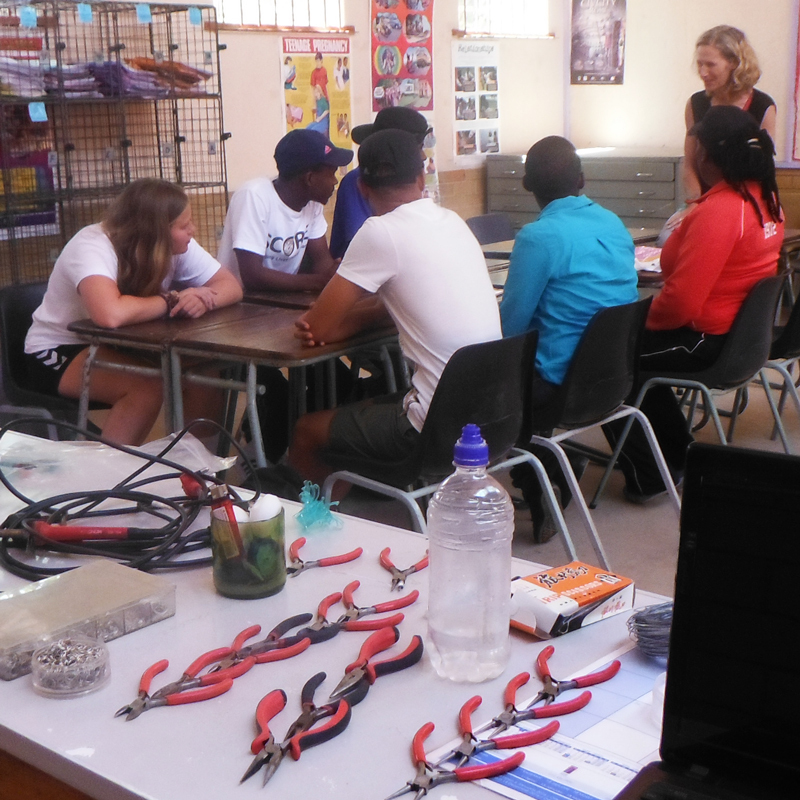 We will be teaching you cutting skills, shaping skills and wiring skills, to mention just some of the fun we’ll be having while learning the process of creating fun and funky jewellery. Get ready to create some interesting and off the wall necklaces, bracelets and earrings. One of Upcycles most popular selling items off our web-site is the Aids Day Brooch. It’s tremendously easy to teach and even simpler to make yourself. 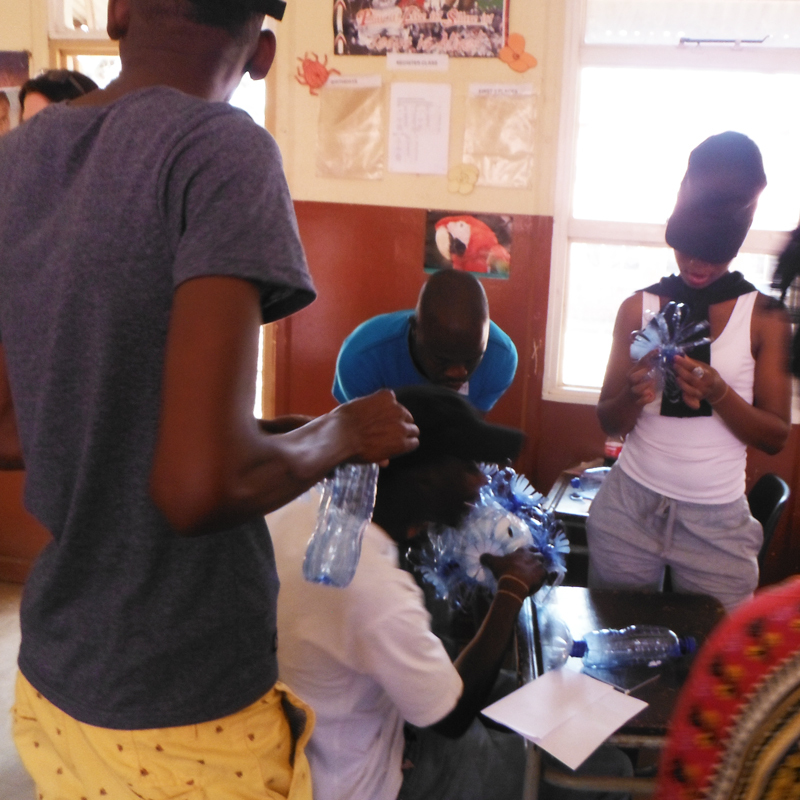 But why stop at just Aids Day, with some paint, some string, some wire and even some beads, you can create brooches for all our social awareness campaigns. Pink brooches for Breast Cancer, Black ribbons for Mourning, Yellow ribbons for Cancer Awareness in Children, just to name a few. Once of our most favourite things must be skills training, but having the right skills also required having the right tools. Tin Picture Frames can be as easy pie, but when you add some extra tools to the process the finished product can be transformed from plain and simple to extravagant and awesome. As with the Tin Can Picture Frames, we can show you how to make basic Christmas decorations. Letting your mind roam and understanding the different applications using different tools, you can make even the most basic Christmas Star, the most intricate decoration on your tree. 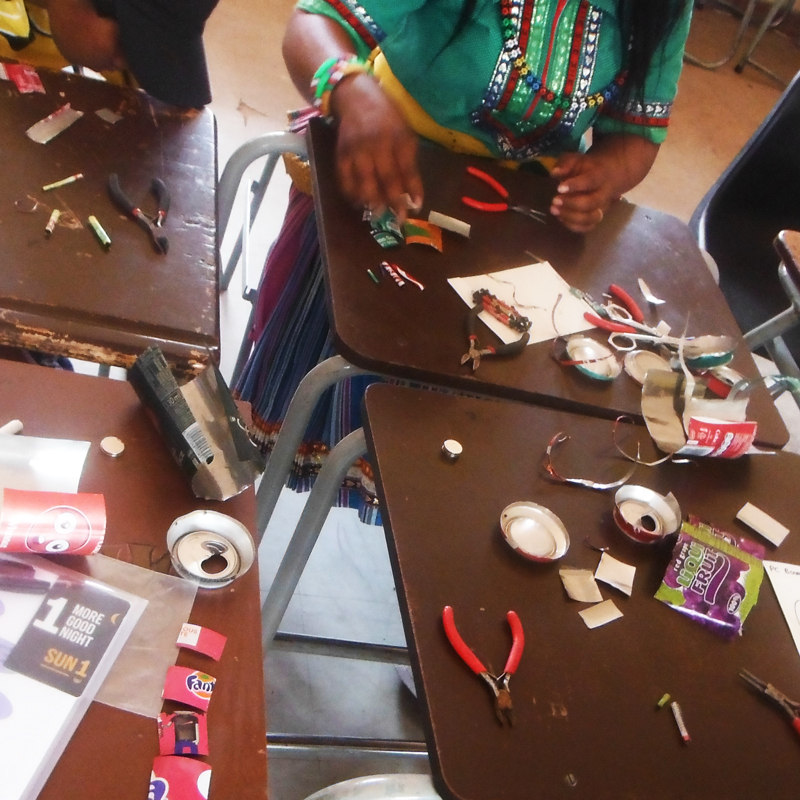 This course is designed to run over 5 days and covers a variety of craft skill incorporating soda tin cans as it preferred medium of choice. The course will help develop your ideas base and show you how to make almost anything from what you would ordinarily consider to be just waste. This course is designed to run over 5 days and covers a variety of craft skill incorporating paper as it preferred medium of choice. The course will help develop your ideas base and show you how to make almost anything from what you would ordinarily consider to be just waste. This course is designed to run over 5 days and covers a variety of craft skill incorporating milk bottle as it preferred medium of choice. The course will help develop your ideas base and show you how to make almost anything from what you would ordinarily consider to be just waste. This course is designed to run over 5 days and covers a variety of craft skill incorporatingcoffee tin as it preferred medium of choice. The course will help develop your ideas base and show you how to make almost anything from what you would ordinarily consider to be just waste.